Quality and style. They’re not the same for everyone. As individuals we all have our own sense of style, but quality is quality and it’s hard to deny admitting good quality when you see it. 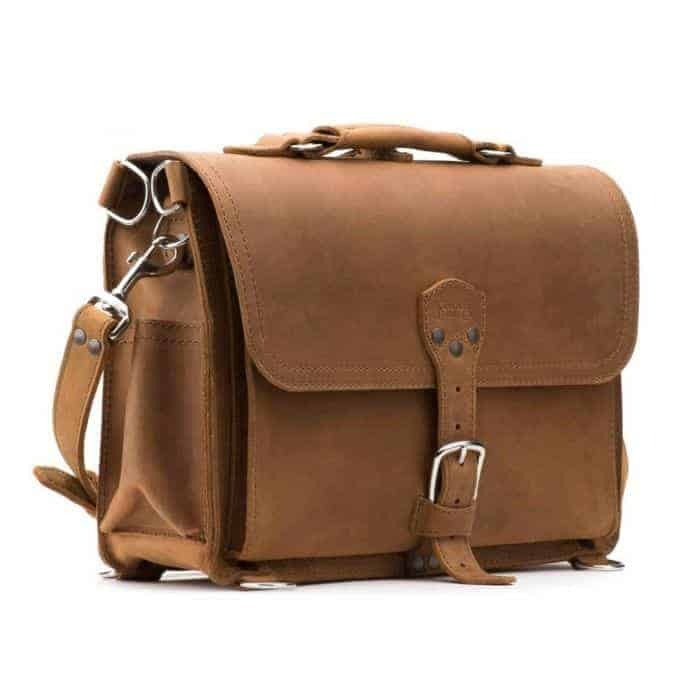 To me, that’s what I think of when I think of a Saddleback bag and the Slim Laptop Briefcase is a perfect example, from the thick leather to the metal clips and rings. As a photographer, image matters. Not just the image I create with my camera, but the image I portray in my brand and who I am. I always stress that photography is about much more than just creating beautiful images, it’s a relationship. Relationships start with a first impression. Having the Slim Laptop Briefcase with me as I meet a client is a great way to start things off. I’ve had many many compliments on how sharp this bag looks! When my nose isn’t in the bag breathing in the aroma of glorious leather, I’m utilizing the many different pockets with my laptop, magazines, journals and more. I carry a 15” MacBook Pro. At first I was disappointed to see that it didn’t fit inside the floppy pocket that would hold a 13”, but as soon as I placed it in the main compartment, my concerns quickly faded. A 13” would even fit in the front exterior pocket, but I personally wouldn’t store it there with the lack of snaps or buckles on the actual flap to keep it closed. 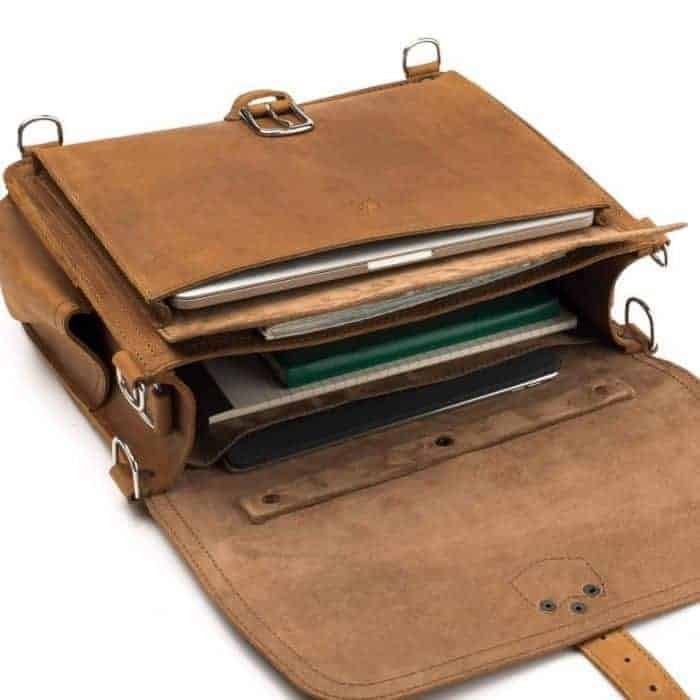 I do, however, feel secure about transporting my iPad in there, but most of the time I keep that in the outside back pocket for a quick grab and to avoid having to unbuckle the bag for it. One thing I love about this bag is the amount of pockets. I don’t have to search through one big spot to find what I’m looking for. 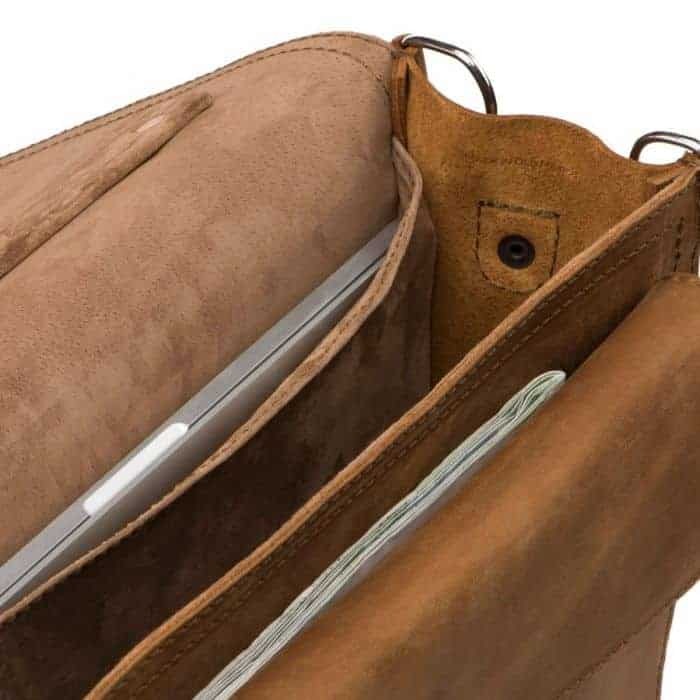 I keep my ipad in one pocket, my computer in the main, magazines in another, and my journal in an additional spot – the space between the large front pocket and the bag actually creates ANOTHER pocket. Inside the main interior there are two side pockets that are great for pens and such, but with my computer filling side to side, I’d rather they not be there because the flaps often catch my laptop as I’m placing it in. The outside side pouches allow for pens or other small quick grab items. I love how the bag has the ability to stand upright by itself. I didn’t realize how much this mattered until I started using it. I often keep my bag on the ground in a coffee shop or when meeting with someone and this bag doesn’t fall over causing it to get dirty or making things slide forward to fall out. I don’t need to lean it against my chair or table leg. The shoulder strap has two adjustable or removable pads attached that allow you to move them comfortably to support the weight, but the main reason there are two pads is so you can convert it from a shoulder bag into a backpack placing each pad on both shoulders. A friend of mine owns the Front Pocket Leather Briefcase which also has this feature. I tried it on as a backpack and found it uncomfortably bulky. 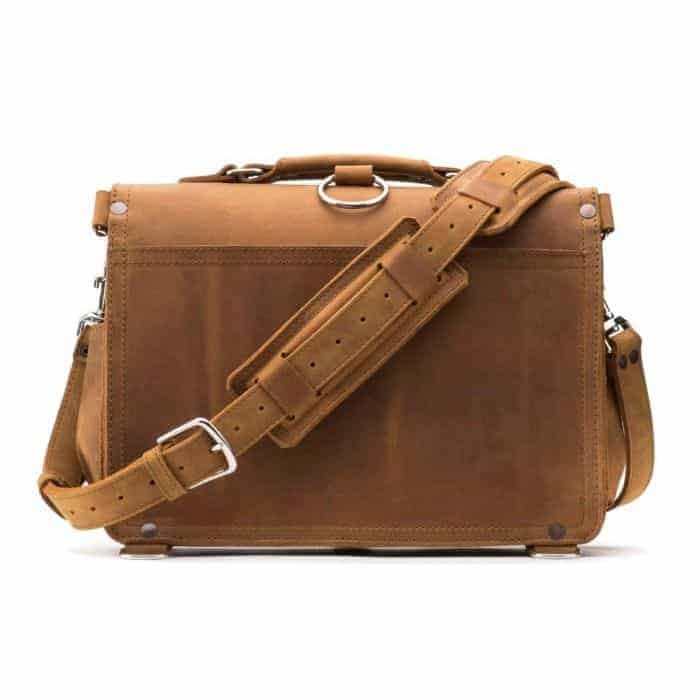 The Slim Laptop Briefcase doesn’t have the bulk giving it a much more natural feel and fairly comfortable if you’re wearing a layers. The reason I say layers is because the thick leather and its seams may not be the most comfortable rubbing against your back with just a shirt on. If you want to alter the bag to a high and close fit when carrying it as a messenger bag, the remaining part of the strap can be pretty long since it adjusts like a belt. There is a loop to place it through, but after a certain length the strap may just hang loose. For photography, the Slim Laptop Briefcase functions best as named – to be used as a laptop bag, but I have used it at times out on a shoot. Most shoots don’t require an immediate use of a computer so I’ve left it at home. The problem with this bag for a photographer is that it doesn’t have any separate dividers to insert camera gear. I’ve made this work for me by inserting a different ICU (internal camera unit) that allows me to store my dslr and a couple lenses. It’s a snug fit but it works, allowing me to carry a dslr with a couple lenses or a mirrorless camera with some space for more. Without any padding stitched into their bags, the thickness of the leather provides some protection but may leave some people feeling cautious. One thing I’ve learned about leather bags is that the more distressed the leather gets, the more beautiful the bag becomes. A newly fresh leather bag has no marks yet and scratches easily from the beginning. Each scrape and scratch tells a story and I’m excited to see how this bag ages and the stories it will tell. I’ve had this bag now for almost one full year and it’s breaking in nicely! Addicted to traveling, Brian McGuckin has journeyed to 20+ countries around the world. On Sundays you may see him on the sideline shooting NFL football games. Celebrity/athlete event photography, weddings, and portraits allow him to be immersed in different genres of photography. He shares his love of photography as a workshop instructor. Somehow he juggles this with teaching middle school social studies and living life to the fullest with his wife and four kids.